The Police Sergeant, who was interdicted following the incident in Thebuwana, has been reinstated in service last evening (16). The reinstatement was passed by the Inspector General of Police Pujith Jayasundara, stated Police Media Spokesperson. The Police Sergeant was interdicted after he had displayed ‘unruly behavior’ at the Thebuwana Junction while armed with an assault rifle on October 3. A lorry transporting sand had been taken into custody by the Sergeant on September 29, however the Officer-in-Charge (OIC) of the Thebuwana Police Station had released the lorry the following day, stating that the vehicle did have a valid permit to transport sand. In protest of this decision, the Sergeant who is attached to the Thebuwana Police Station had arrived at the Thebuwana Junction along with the T56 assault rifle and refused to budge from spot. Senior police officers and even the relatives of the Sergeant had attempted to talk him out of his actions, but it was to no avail as he even threatened to shoot himself should anyone get close to him. However, after more than 2 hours the STF personnel managed to apprehend the Police Sergeant while the firearm in his hand fired several times during this operation to subdue him, although no one was harmed. The police officer in question was taken into custody on charges that he had behaved in an unruly manner while armed with his service weapon, police said. He was granted bail by the Mathugama Magistrate on October 9. 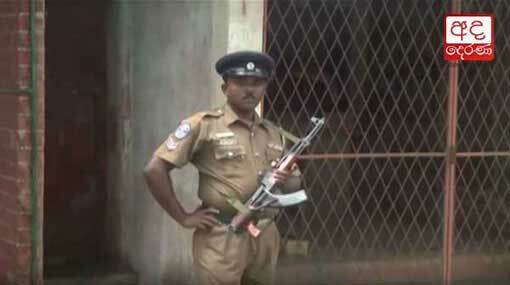 The police officer had reportedly spent some 6 months in the custody of the LTTE during the time of the war. Meanwhile, President Maithripala Sirisena also granted Rs 1 million to the Sergeant following a meeting held with the police officer yesterday (16).